The Tropical Papaya and Pineapple dessert has two main ingredients, fresh ripe papaya and pineapple. Other ingredients are jellies, which are side favorites for most desserts (Che`) in Viet Nam. It is light and fruity, and great for hot summer days. This week's hot weather was a treat for me, nice 90 degrees at some point during the days, but sadly, it's going away this weekend. The preparation is simple once you have all your ingredients prepared. I have been eyeing some Elkay sinks since ours is about twenty something years old. My sink functions, but it would just make my cooking a little easier to have a build in sprayer at the sink. Ingredients: Fresh ripe papaya and pineapple cut into half inch squares. Green jelly, the kind that you have to cook yourself, and ready made coconut jelly squares in a jar or a can. 1 can of coconut milk. Preparation: 1) Cook the green jelly, follow instructions, and slice them thin, about 2 inches long but 1/4 inch width, set it aside. 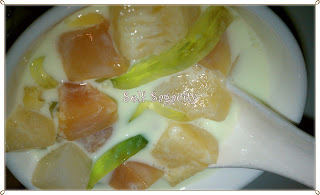 2) Prepare the coconut milk, adding sugar to suit taste, or use the sweetened coconut milk. Depending on how many people you are making this dessert for, but one large can of coconut milk amounts to four servings. 3) In a large bowl, pour in coconut milk, mix in the papaya and pineapple, and add coconut and green jelly. You can serve it cool, just put it in the refrigerator, or warm by replacing the bowl with a large pot on medium heat and repeat step 3. Yummy dessert, and sounds like something I want to do. The easy way, that's it! I have not tried the green jelly, very reluctant. We have a similar dish except we use heavy cream or condensed milk instead of coconut milk. 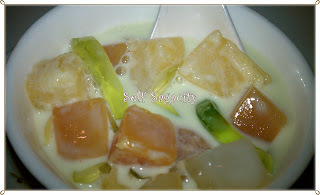 We use "nata de coco" or kaong as substitute for coconut. Hmmm, this is making me hungry! Very exotic flavors. I love them all. Wow, what an interesting dish! yum! The dessert sounds very refreshing...with two of my favorite fruits!!! It looks very pretty, but I prefer fruit that is more tart. oh this one i do miss. from where i came from papaya is in abundance. what we normally do with mixed fruits like these is put shaved ice on it and milk. so yummmy. we call it halo-halo which is the tagalog word for "mix"
Hello Michelle, you can buy the ready made coconut jelly squares in a "jar" and at the Asian markets. They are usually located in the sugar, specialty aisle.